In the Redstone missile, fuel and oxidizer were delivered to the thrust chamber by a two-stage turbopump which drove the alcohol and LOX pumps. The turbopump was powered by steam generated through the reaction of hydrogen peroxide and potassium permanganate in the peroxide steam generator. 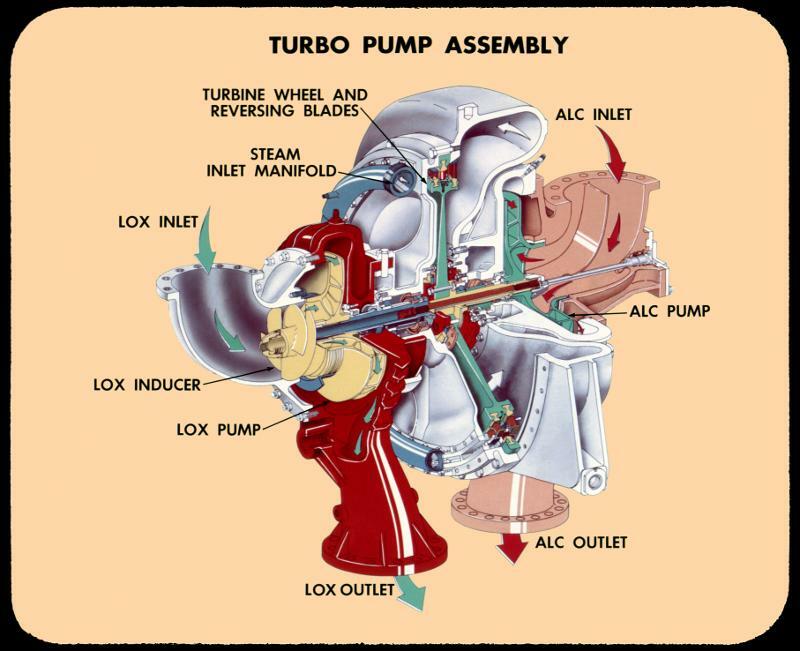 The turbopump consisted of a turbine, a gear reduction section and two centrifugal pumps. These pumps were coupled to the turbine shaft and were driven at the same speed, delivering the propellants at the flow rates and pressures needed to maintain engine operation. It took about 0.3 seconds for the turbopump to reach operating speed. Click image for a 3631x2955 pixel version of this image in a new window. From a series of Chrysler Missile lantern slides in the archives of the U.S. Space & Rocket Center. Scan and restoration by heroicrelics. We see that the turbine disc had two stages mounted on a single disc (unlike the later Rocketdyne Mark 3 turbine, which had two separate turbine discs). The turbine is also mounted inline with the turbopumps, rather than mounted separately and connected through an elaborate gearbox. At the left side of the diagram is the LOX pump, which consists of an inducer and main impeller. The alcohol pump, at right, appears to lack an inducer and has a larger-diameter impeller. Note the flow splitter on the alcohol inlet. 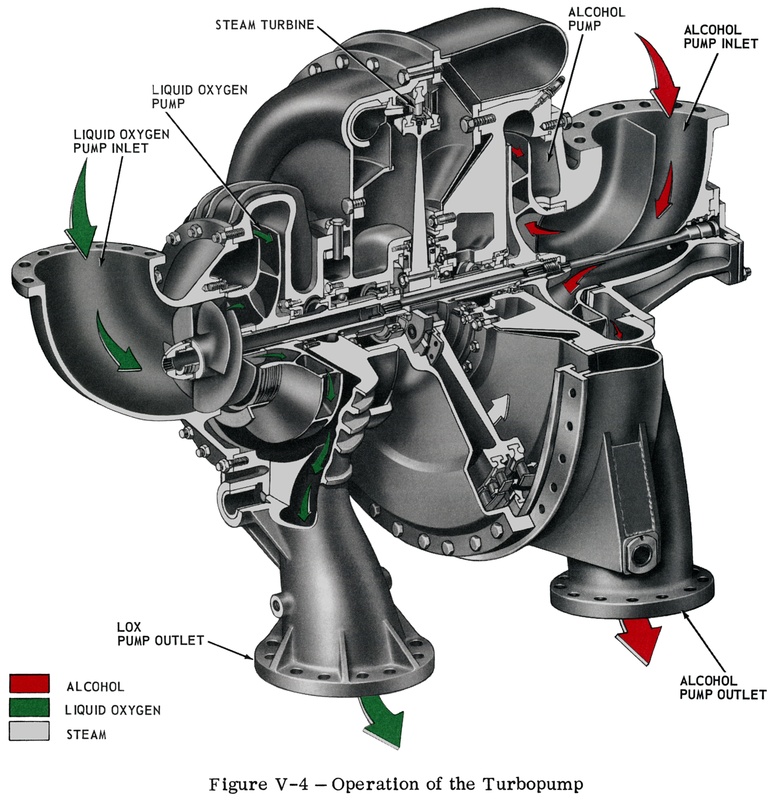 I could never visualize what a turbopump impeller actually looked like by referring to diagrams such as this; it was not until I saw the impellers from a disassembled F-1 rocket engine that these diagrams made any sense. Click image for a 3834x3956 pixel version of this image in a new window. The bulk of the introductory text was taken, sometimes verbatim, from This is Redstone .